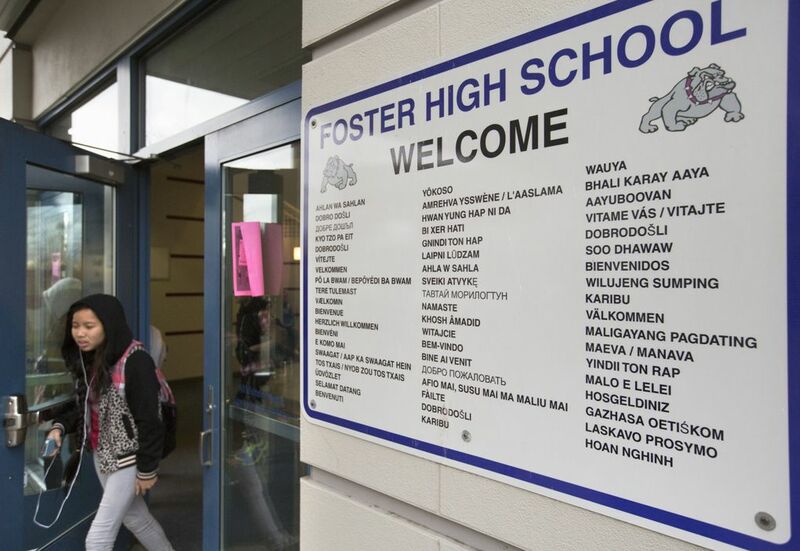 Just four years ago, Foster High’s test scores were low and morale lower. But in a dramatic turnaround, achievement now is way up, especially in math. On his very first calculus exam, Sergey Pristupa got a big, fat F. On the ceiling above his bed, he taped his grade — a measly 54 percent — and stared at it each night before drifting off to sleep. And he vowed to do better, showing up at 6:30 a.m. for extra help from a teacher who was at his desk before sunrise. His grades went up. He never got another below 85 percent. 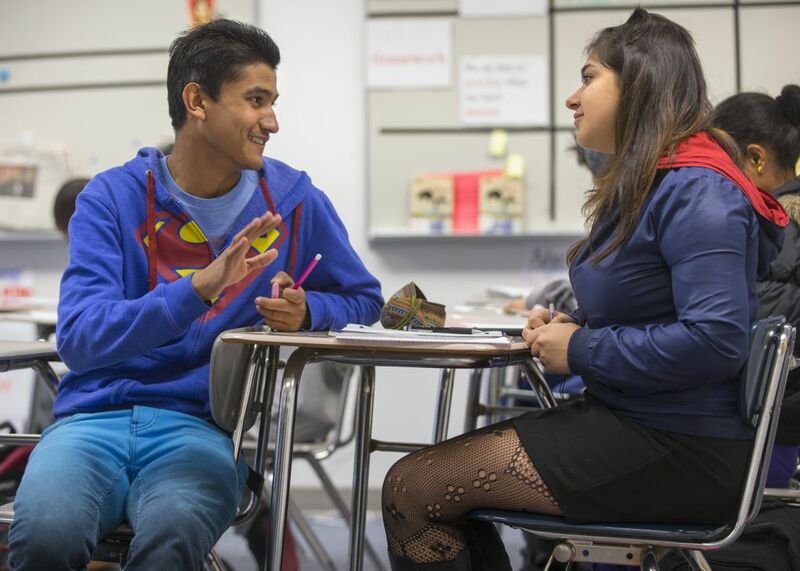 Pristupa’s classroom trajectory mirrors that of his school, Foster High in Tukwila, one of the nation’s most diverse schools. 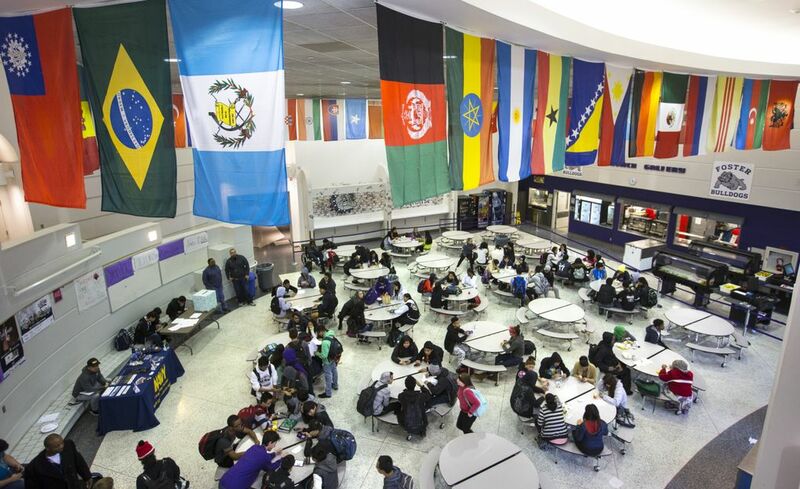 Seventy-five percent of the students are immigrants and refugees, from virtually every strife-torn corner of the globe. Foster still lags behind other state schools in some indicators, particularly reading. But morale is high. And the occasional fistfight notwithstanding, peace reigns in corridors filled with kids from countries torn by clan warfare, religious conflict and civil strife. The students come from 51 countries and speak 44 languages. 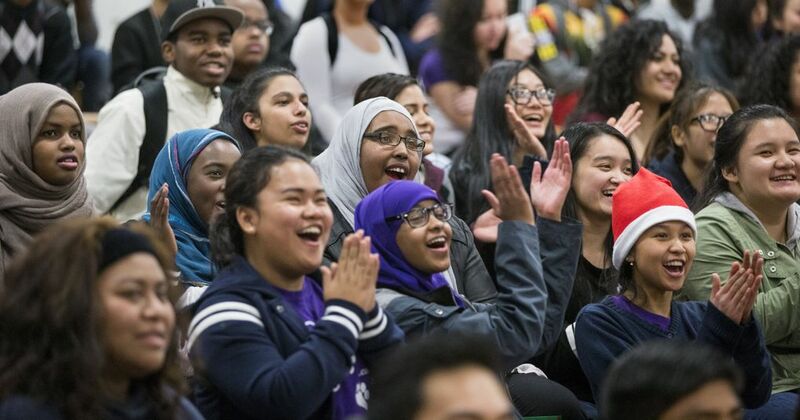 At a recent meeting of the hip-hop club, Justine Palacio, a 4’10’’ Filipina firecracker, taught her latest choreography to a Muslim girl in a hijab, a Christian girl from Iran, and kids from Burma, Laos, Mexico, Guam, Japan, Vietnam and Cambodia. Larson and Foster teachers have a hard time putting their finger on any one change as key. 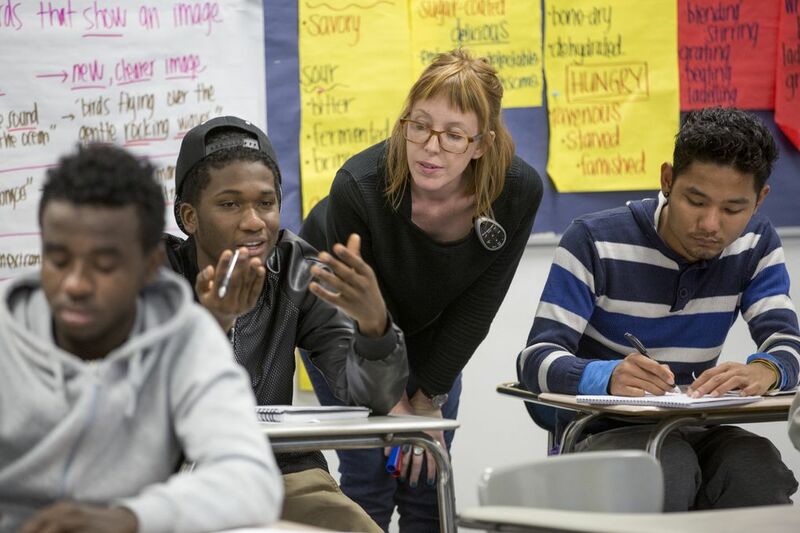 The story of Foster’s rise may be as simple — and hard — as figuring out what their students need — English lessons, extra math help, a warm jacket or a quiet room — and finding a way to get it. “We adjusted our program to meet the needs of our kids, and they have really flowered,” said math teacher Brian Seigel. Gamboa stuck it out for one simple reason: She loves the challenge of working with students from all over the world. The new kids started arriving in the mid-1990s, transforming what had been an overwhelmingly white school. That’s when the International Rescue Committee, which has an office less than a mile away, began settling refugees in Tukwila, where cheap housing was widely available. First came the Bosnians and the Serbs, as well as Vietnamese, Laotians and Cambodians. Then came Somalis and Ethiopians and Eritreans. 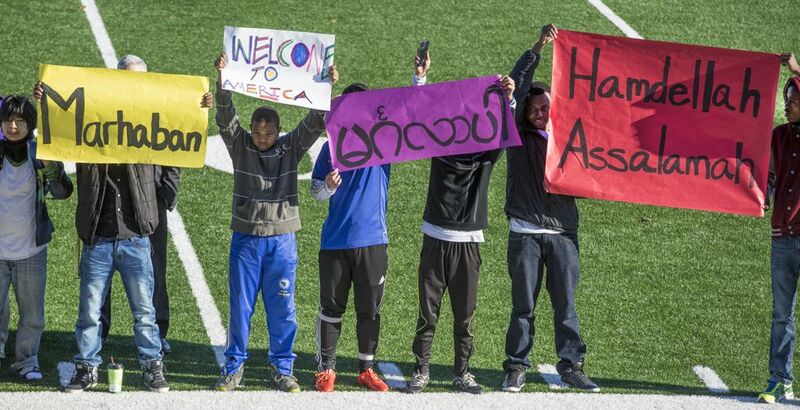 The most recent wave has brought Burmese, Nepalese, Iranians and Iraqis. Jeewan Poudel, a Foster junior, grew up in a Nepali refugee camp in a ramshackle house with dirt floors, a tin roof and no plumbing. He waited in line for two and a half hours to fill the family’s water jugs before lugging them back home. When he arrived in Seattle five years ago, his incomprehension of American culture was as vast as his English vocabulary was tiny. In his first days here, he figured he could follow Alaska Street straight to Anchorage, a memory that now makes him laugh. Many Foster students are coping with the aftermath of trauma, and school counselors have had training to help with that. 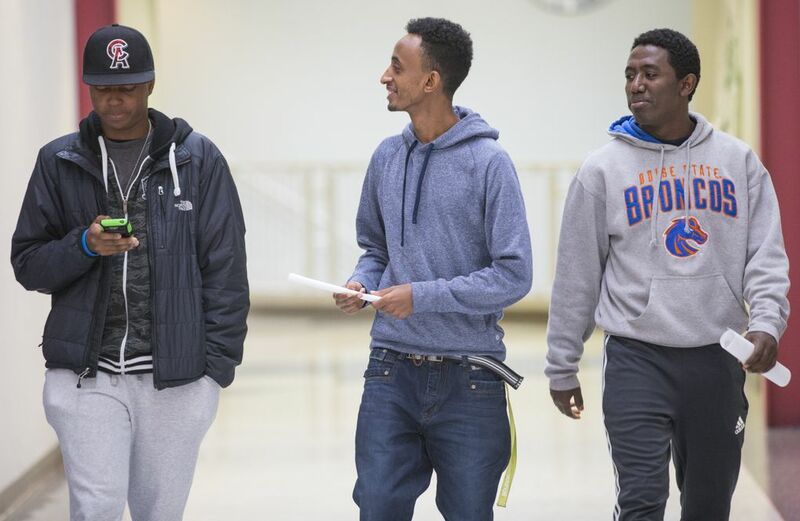 “I have seen a lot of dead bodies and a lot of people killing each other,” said Hamza Abdullahi, a junior who came to Tukwila three years ago from a Kenyan refugee camp after his parents fled Ethiopia, their homeland. One day, Abdullahi was walking home when he saw a man with a small bag of groceries fleeing an angry mob run toward him. Poor and desperate, he had apparently stolen the food to feed his family. The man tripped and fell at Abdullahi’s feet. Two men stepped forward and shot him in the chest in front of his daughter, who looked to be 5 or 6 years old. She leaned down and hugged him. “Daddy, I love you,” she cried. 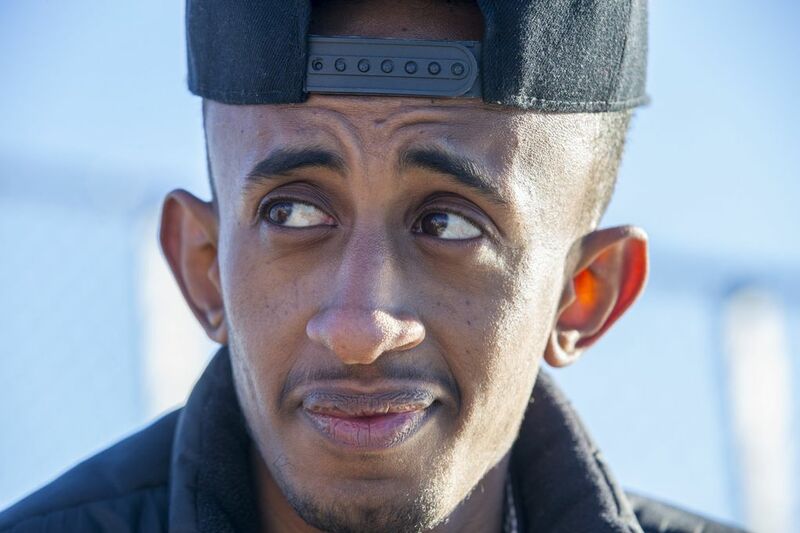 “I had nightmares for three months after that,” Abdullahi said. Foster’s transformation first took root in the math department, where a strong corps of teachers has bonded in the years since all the staff turmoil. In his second year, Seigel became the department chair. He and his colleagues promptly threw out a curriculum based on small-group discussions — not the best fit for kids still learning English. And they replaced a textbook that posed word problems such as American football yardage to kids who only knew soccer and the metric system. They developed a culturally appropriate, in-house curriculum and found a more traditional textbook with fewer confusing word problems. Meanwhile, the staff consulted with their counterparts at the local middle school, examining the grades and test scores of entering freshmen. And they added a class for ninth-graders who weren’t ready for algebra. In 2010, Foster students scored 25 points below the state average on their end-of-year exam. Over the next four years, they were an average of 11 points ahead. 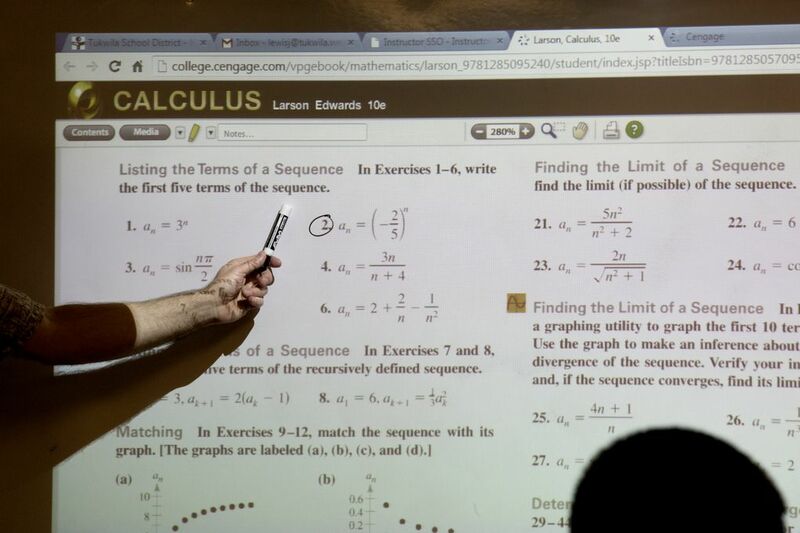 And after Jeff Lewis took over the calculus classes three years ago, those scores also surged. In the five previous years, just 21 percent of the students passed the Advanced Placement exam. Two years ago, that figure shot up to 59 percent, and last year hit 73 percent — above the state and national average. On a recent morning, Lewis stood in front of his class in shorts, white sneakers and a Hawaiian-style shirt, dispensing a blend of cornball humor and explication that has proved effective. He described “extrema” — the maximum or minimum value of a function. 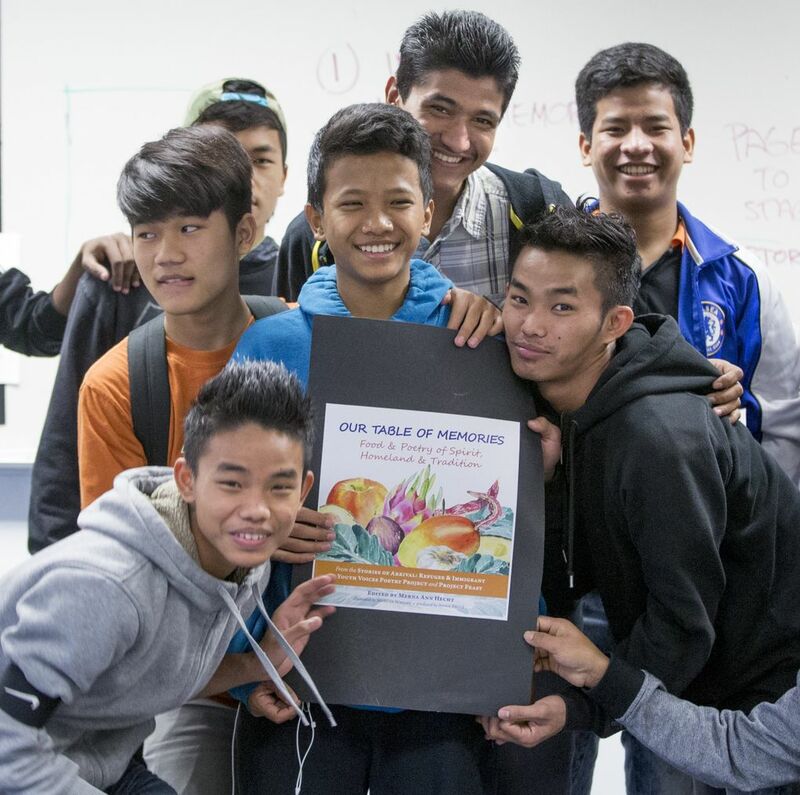 He shows up at 6 a.m. to help students like Pristupa — the guy with the 54 percent plastered above his bed — and holds Saturday classes when exams are approaching. 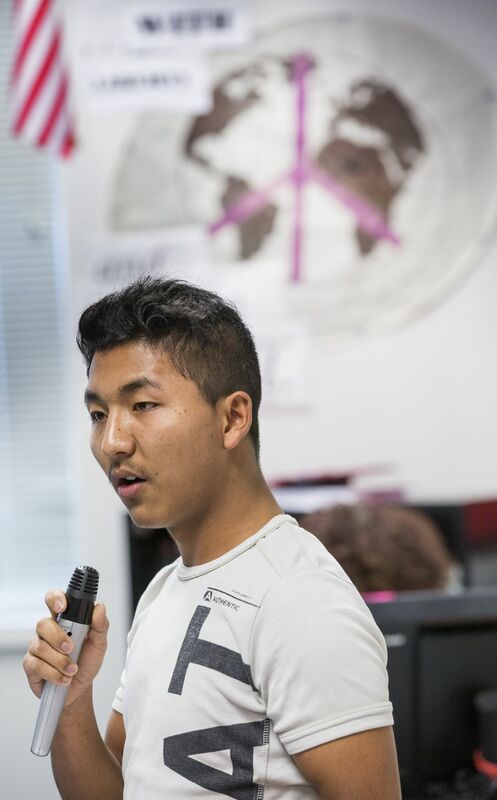 “He’s the best teacher in the school,” said Pristupa, who ultimately passed the AP exam last year. In 2012 and 2014, Foster scored all tens on the 10-point scale the state Office of Public Instruction uses to measure math improvement. When Larson arrived in 2013, she undertook a systemic review of the school’s approach to instruction, its structure and its culture. Did the curriculum meet the needs of all students? Did the school have coherent communications systems? Did the faculty, students and staff treat one another with respect? The answer, she found, was a resounding no. The teachers were angry and resentful at the administration. Students were missing class. Those who fell behind had no way to catch up. She spent her first year mending the administration’s broken relationship with the staff. She started by holding two days of rolling staff meetings, inviting teachers to share their thoughts about the school’s successes and failures. Despite all the anger, Larson emerged from the meetings feeling hopeful. She had been at schools where the staff believed their students were incapable of learning. 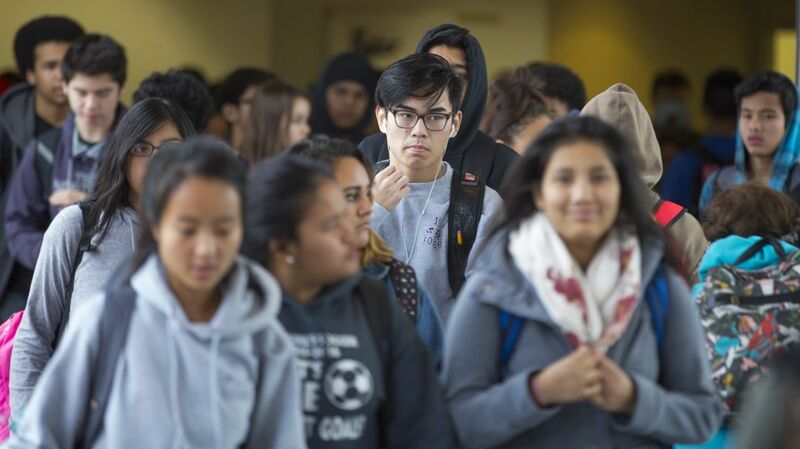 At Foster, no one was ready to consign their students to failure. 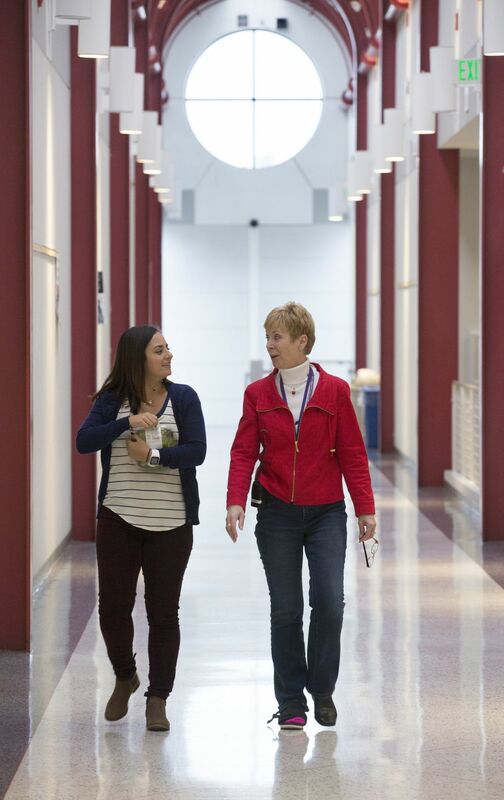 Many of the first changes she implemented were organizational — a master schedule for the entire school, a staff newsletter and calendar that kept everyone on the same page. 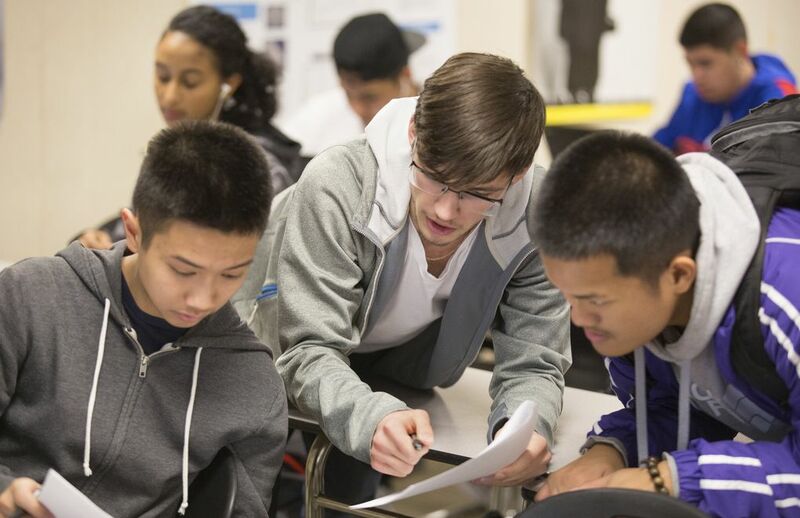 Improving the dismal graduation rate — then just 55 percent — was a priority. But Larson wanted to improve education for all kids, not just those at the bottom. Advanced Placement classes were opened up to anyone who wanted to enroll. The counselors interviewed each student one-on-one to make sure they didn’t overcommit. And Larson found money for an AP boot camp each summer to prepare students for the hard work to come. Meanwhile, the school took steps to help struggling students graduate. That meant long conversations persuading the district to change its discipline policy, which had forbidden suspended students from making up missed homework. 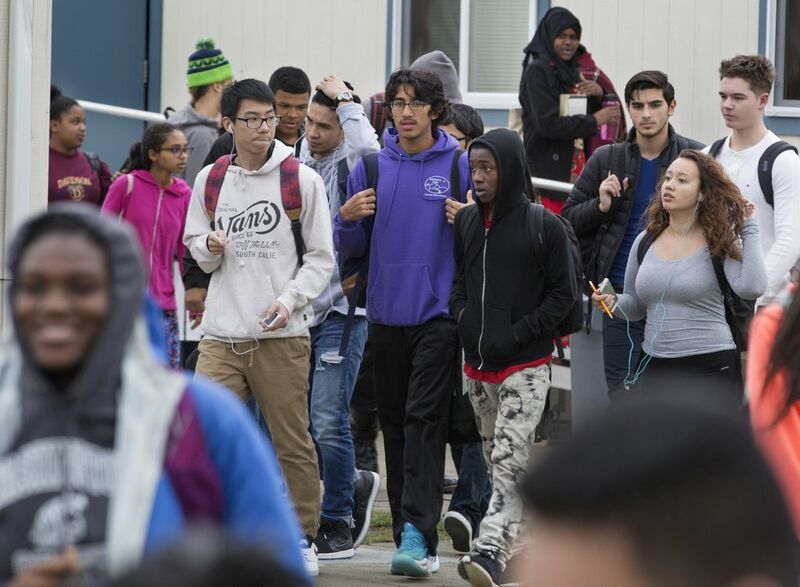 Staffers scoured achievement data to see which kids were in danger of failing, and the school hired a staff member to help students find online credit recovery classes and other supports. 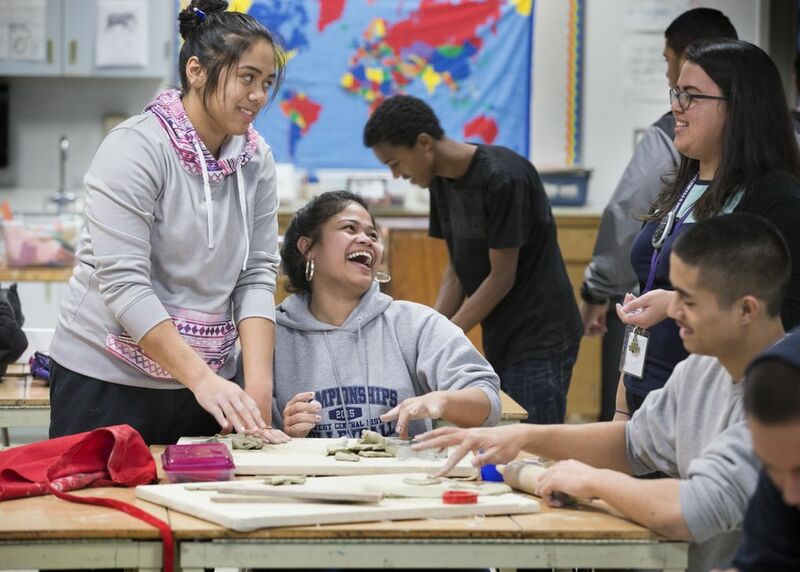 Larson has also boosted the school’s commitment to the AVID program, which seeks out students in the middle — kids who have the potential to thrive at college but need an extra push to get there. Even with all the improvements, many Foster students need extra help. It’s hard to be a student when your parents have little education, money is tight, and your house is tiny — assuming you’re lucky enough to have one. 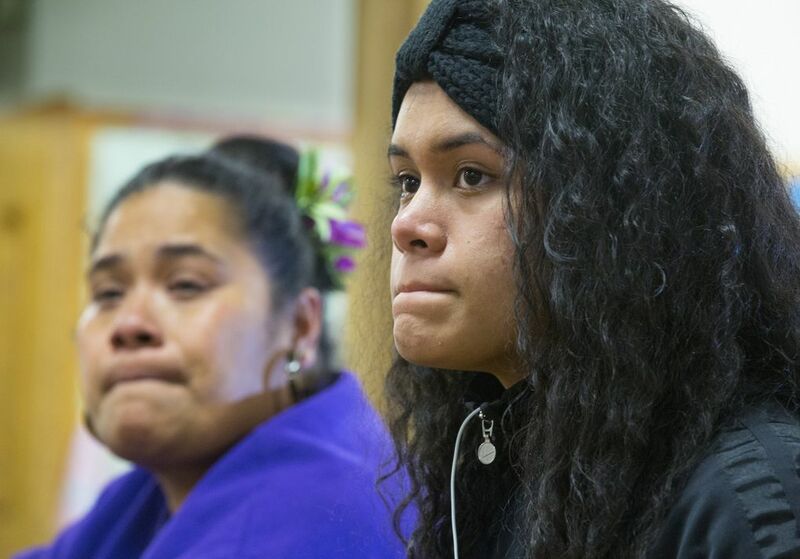 They found bedding for the family of Tavaesina Maiava, a Foster senior known to her classmates as “T.” Her large Pacific Islander family had lived in various homeless shelters before arriving in Tukwila. They now stay in a two-bedroom apartment donated by the Riverton Park United Methodist Church, where T’s father plays piano. For a long time, T kept her situation a secret. But in her sophomore year, her language-arts teacher assigned an essay and told the class to make it pack an emotional punch. “My family was homeless,” T wrote. She read the essay to the class. She read it to the Pacific Islander Club. Each time, she cried. Finally, she read it to the entire school at Foster’s Homecoming, a massive cultural celebration with a parade of flags, international dances and lots of spicy food. She also wanted to show that homeless kids could succeed at school. A senior, she sings in the choir, is president of the Pacific Islander club, and takes two advanced-placement classes. 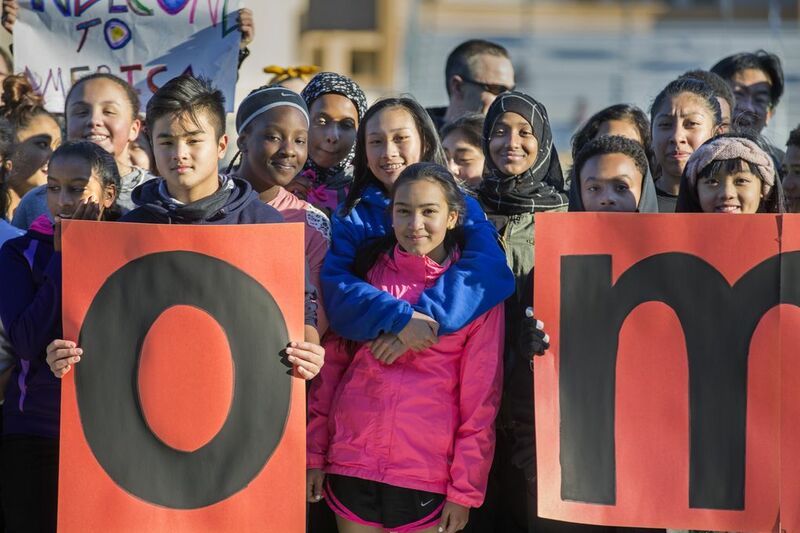 To T and her classmates, two Foster teachers recently published a letter in the school newspaper, reassuring them in the aftermath of world events that have stirred a backlash against immigrants. This story, originally published on Jan. 2, has been corrected. Andrew Parr works for the state Board of Education, not the state’s education department. Ben Stocking: 206-464-2225 or bstocking@seattletimes.com. On Twitter @benstockingk12.